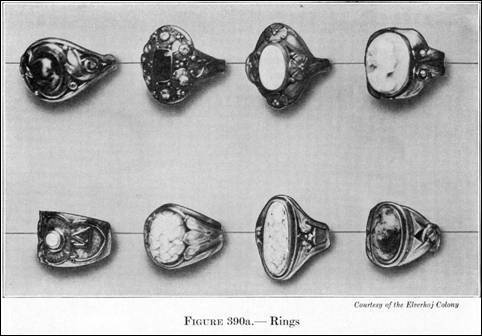 Elverhöj rings from Varnum's 1916 "Industrial Arts Design"
When the English Arts & Crafts luminary C. R. Ashbee traveled to America at the turn of the 20th Century to visit important shapers of the budding American Arts & Crafts movement, he met well-known figures such as Charles Sumner Greene and Frank Lloyd Wright. And he also went to three crafts communities -- Byrdcliffe, Rose Valley, and Elverhöj. Rose Valley (see rosevalleymuseum.org) was founded in 1901 by William Lightfoot Price on 80 acres outside Philadelphia near what had been Rose Valley Mills. The output of this community seems to have been mostly paintings, wood and stone work, pottery, photography, printed matter, and architectural projects, although Herbert Lightfoot Walton did produce ornamental ironwork. 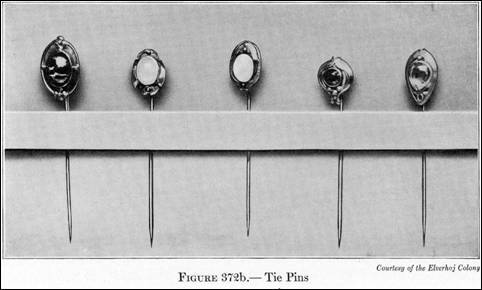 Elverhöj tie pins from Varnum's 1916 "Industrial Arts Design"
The Byrdcliffe Arts Colony (winterthur.org/about/byrdcliffe.asp), still in operation today, was started in 1901 on a large tract of land outside Woodstock, NY, by Ralph Radcliffe Whitehead and his American wife Jane Byrd McCall. One of its first buildings was a metalcrafting shop. Another utopian community in upstate New York was Elverhöj (pronounced el-ver-hoy), begun in 1913 in Milton-on-the-Hudson by two painters and silversmiths, A. H. Andersen and Johannes Morton. The name Elverhöj means "elf hill" or "elf mound" and dates back to an 1828 Danish play by that name about a king who visits wood nymphs at night. 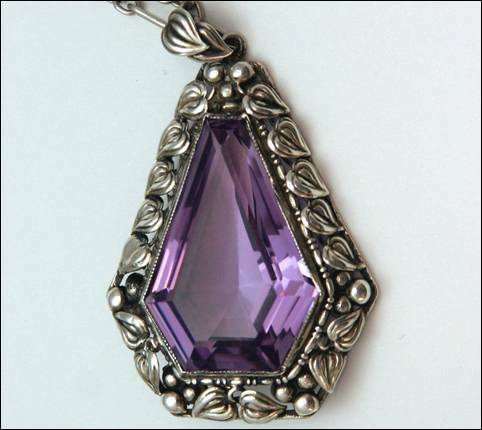 The pendant below was made by Elverhöj craftsman James Scott, and was purchased directly from him. 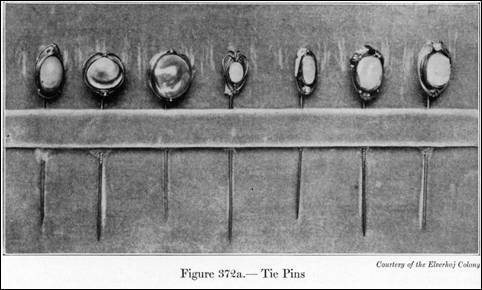 Ark Antiques mentions that Scott, along with Morton and Joseph Popelka, "exhibited 27 items of jewelry and a silver repoussé plate, under the Elverhöj Colony name at the 13th annual exhibit of Arts & Crafts held in 1914 at the Art Institute of Chicago." Elverhöj pendants from Varnum's 1916 "Industrial Arts Design"
Interestingly, the Elverhöj community grounds were sold in 1939 to Father Divine (and later to the Northeastern Conference of Seventh Day Adventists). Divine, founder of the Peace Mission Movement, was portrayed by the press both as a mad cult leader and a progressive social visionary and desegregationist. His followers considered him to be godlike, and in 1931 a snappy quip of his made him an overnight celebrity. According to PBS's "This Far by Faith" (pbs.org/thisfarbyfaith/journey_3/p_10.html), "the local authorities arrested Father Divine and dozens of his disciples in Sayville, Long Island, for 'invading the county with his religious practices,' which included black men and white women living in the same house together. Divine was convicted and sentenced to a year in jail by a biased judge, Lewis J. Smith. Three days after imposing the sentence, however, Judge Smith, 55, dropped dead. When a reporter asked the jailed preacher for a comment, Divine replied, 'I hated to do it.'" 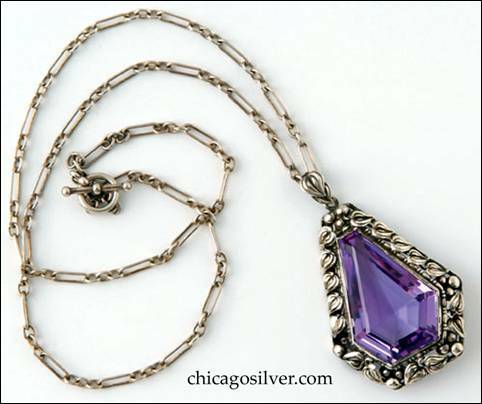 Pendant, 2" H, on chain 19" L. Handwrought in sterling silver by James Scott of the Elverhöj community, the pendant features elegantly fashioned leaves and beadwork forming a border around a central teardrop-shaped faceted amethyst. 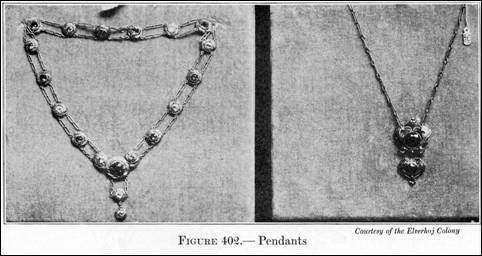 The period chain is not original to the piece.